When I started wearing hijab about 10 years ago (more or less), I did it out of sense of duty to Allah. I believed – and still do – that Allah commands us to dress modestly and appear a certain way in public or in front of non-mahram (non-familial) males. Since I was new to Islam, I wasn’t completely aware of the injunctions he also placed on men to dress and behave in their own form of modesty. I’ve since learned that – shockingly! – men, too, must dress appropriately when in public or around non-mahram women. We can save the societal double-standards discussion for another day. As any new hijabi knows, it takes a while to get the hang of wrapping yourself in a scarf every day. I’m not talking about the temperature. I’m not even referring to the mental fortitude one must develop to go out in public dressed extremely different than the cultural norms of society (depending on where you’re from). I’m talking about the literal act of wrapping the hijab. Not getting it to fall off. Or choke you. Or look like you took a giant curtain and twisted it around your head. Or just gave up and piled a bunch of material on top. Or – my personal favorite – like you stuffed your head in a pillowcase and cinched it so tight your cheeks turn purple. As time passed, I became more accustomed to the art of scarf-wrapping. In fact, I can now do it without looking in the mirror – an amazing feat, if you ask me. And, once again, I realize even though I’ve taken care to display the most modest appearance possible (for me), I’m still taking the chance someone might get a glimpse and ogle me. All at once, I am relegated to the display case in a butcher shop. Something men can stare at, drool over (yeah, okay) and decide whether to take home or skip over. While I do my best to remind the hubs that it’s called “skin” and not “meat”, and that I’m not a piece of it, when I see others making ridiculous comparisons between women who wear hijab and those who don’t, I do my best to change the discourse. Or at least draw attention to the oversimplification and objectification that such comparisons promote. While doing my work scanning Facebook the other day, I came across the following cartoon that had been posted on a Christian/Muslim debate page by Sara Hassan Walid. At the time, I was just making a statement. I didn’t realize why the cartoon so badly rubbed me the wrong way. Was it the colors? The word choice? The over-patriarchal man dressed in what looks like his sleeping gown and slippers? Finally, it occurred to me. In all sincerity, the whole cartoon makes it seem like men have devised this way of concealing something of importance (I would’ve chosen something more precious….like a diamond, as per usual). However, wearing hijab is not something men came up with to protect and conceal things. Hijab is a commandment of Allah, and He decreed it as protection from unwanted advances and for modesty purposes. 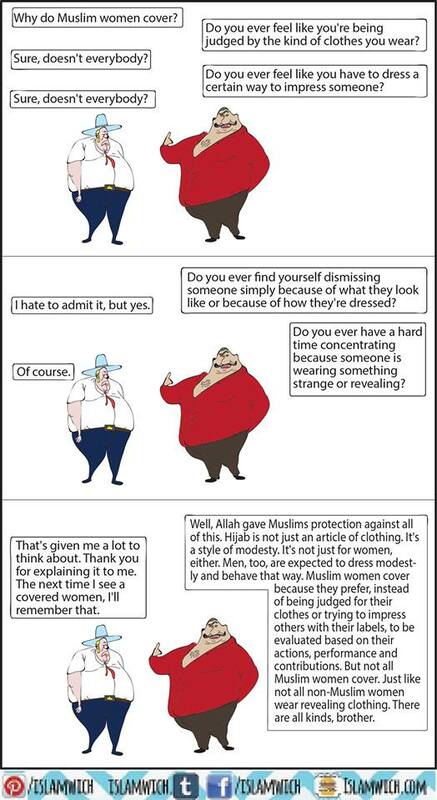 The cartoon nearly comes to the point of having men claim ownership of the idea of hijab. Astigfur Allah! Next, and probably most glaringly, the tactic of comparing modesty to an apple is ridiculous. First, there is no direct connection. Second, it simplifies the beauty and ultimate purpose of the hijab. Third, an apple can be washed off if it gets physically dirty, as can a person. However, hijab does not prevent a person from getting spiritually dirty (sinning) any more than a cloth keeps an apple from rotting on the inside. The whole analogy is just……. In other such cartoons, the comparison has been between women and pearls or diamonds (or other precious items). At least this is slightly more connected. The purpose in covering a diamond is to protect it from….jealousy, coveting, theft (a more synonymous analogy, albeit still personally offensive). But the purpose in covering fruit is to keep it clean, right? To stop it from spoiling? 1) Men “cover their women”. Men don’t do this. Sure, some men do out of jealousy or control issues — but the commandment to cover comes from Allah, not man. 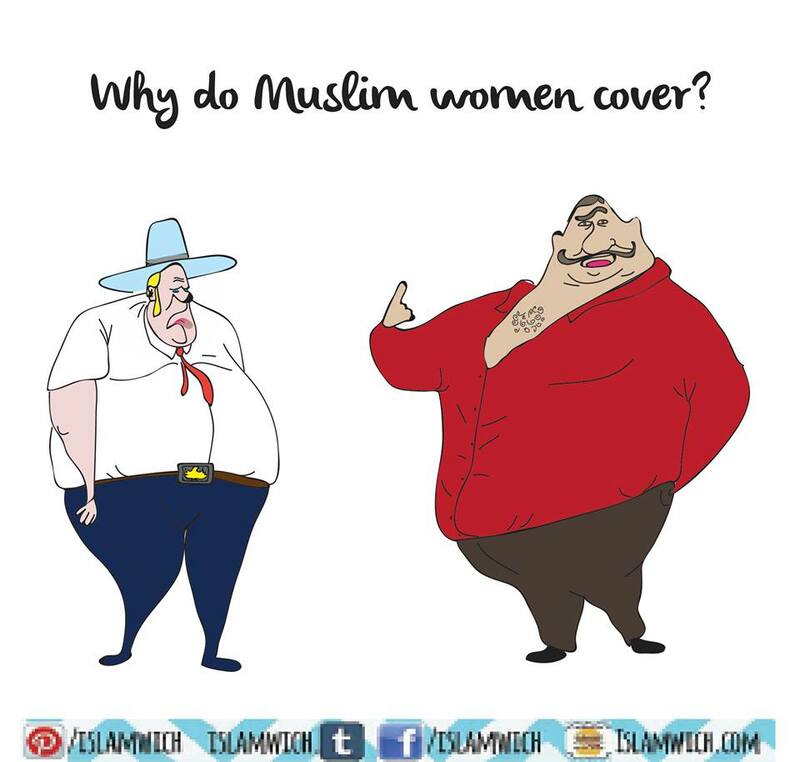 This cartoon plays into the stereotype that Muslim men “make their wives cover”. This is wrong. 2) “Covering an apple” (or diamond, as previously stated) would be to keep it clean. Now, it’s just plain naive to think wearing hijab keeps a woman “clean” (sinless, pure, modest, chaste … whatever you want to associate “clean” with). And it’s offensive to say that just because a woman doesn’t wear hijab means she’ll be “dirty”. This analogy feeds into the stereotype that men “pick” women based on cleanliness (purity, virginity, sinlessness (?!?! ), demureness). Well, shouldn’t this go both ways? Where is the cartoon about a Christian woman (as this cartoon is labeled Christian vs. Muslim debate) asking a Muslim woman why they “make their men wear long beards” or “make their men wear thobes (Islamic dresses for men) to the ankles”? Man 1: Why do Muslim women cover? Man 2: Do you ever feel like you’re being judged by the kind of clothes you wear? Man 1: Sure, doesn’t everybody? Man 2: Do you ever feel like you have to dress a certain way to impress someone? Man 2: Do you ever find yourself dismissing someone simply because of what they look like or because of how they’re dressed? Man 1: I hate to admit it, but yes. Man 2: Do you ever have a hard time concentrating because someone is wearing something strange or revealing? Man 2: Well, Allah gave Muslims protection against all of this. Hijab is not just an article of clothing. It’s a style of modesty. It’s not just for women, either. Men, too, are expected to dress modestly and behave that way. Muslim women cover because they prefer, instead of being judged for their clothes or trying to impress others with their labels, to be evaluated based on their actions, performance and contributions. But not all Muslim women cover. Just like not all non-Muslim women wear revealing clothing. There are all kinds, brother. Man 1: That’s given me a lot to think about. Thank you for explaining it to me. The next time I see a covered women, I’ll remember that. Isn’t that a better conversation? It asks specific questions, clarifies purpose and intent, and also spreads positive knowledge about Islam and modesty. Bottom line, hijab is more than just a cover. And women are more than just objects that need to be “kept clean”. Oh … and just for a final blow … I can’t stand the image of the non-Muslim man. It looks like someone photoshopped a banana out of his hand. Like he was walking by, eating a banana, and asked this question — which prompted the answer using the analogy of fruit. And, in any matter, if the writer HAD to use fruit … a banana would’ve been better. Just think of a chic scarf; how you would wrap it n do just this. Its enough dear.. Sister I completely agree with you. This cartoon, among others are downright insulting and disgusting really. I think these Muslims, that is if they be Muslims, must still think they are in the 1980’s. These pathetic videos and sermons that are abundant on social media show the dimwitted we have become, not to mention that it shows the stereotype of Muslim men hoarding “their” women. Ugg. Du rags ??? What you a gangsta ? No, Hyde. I was a theatre major in college (pre-Islam days)…..and du rags (forgive the misspelling…:-) ) were the rage for what we call strike (clean-up post-production) and those lazy days when you wake up 5 minutes before class and barely have time to grab your books and brush your teeth. A fellow thespian ? We acknowledge. I’ve a feeling this particular pic was made by someone deliberately trying to wind up Muslims by mimicking the analogy that makes more sense (though still problematic) – and then passing the pic off as though Muslim made it. The notion of apples and covers makes no sense, as you say. I agree. Well said. I would rather the conversation be between two women. Sabeeha…..that’s a good idea. Eliminate the male input totally! “Eliminate the male input totally”…sons, fathers, brothers, husband, uncles, grandfathers, nephews, cousins…all gone. Clearly, I was being facetious. ModWestMuse, thanks for reading. I, too, have seen the “candy” one. I’m just as offended by that one. The same insinuation applies….covering something makes it clean. But it doesn’t. The candy, though covered, has an expiration date and will deteriorate from the inside. And a woman who wears no hijab can be just as pious….or more so….than a woman who does wear it. The creator of the cartoon is unknown, and since I cannot find this cartoon on the internet – only on the page I read it on – I can only assume the poster created it – a Muslim woman who wears hijab. Still, there are lots of women who nod their heads in acceptance of the analogy between candy, food or precious jewels and themselves. Objectification is not one-sided. This could just as easily be applied to Muslims, especially those in Western Muslim communities like here in Europe where girls (much more so than boys) have to dress a certain way (with the hijab) to maintain appearances for the family within the community. I know this is especially true within the Pakistani community in the UK. I agree. The choice is up to each person who they want to dress to impress. But hijab, for men and women, gives us the option to dress to impress Allah even if some still use it as a way to impress/judge each other. We can always choose to ignore this. That is true that some people guilt or compel their female friends or relatives into dressing a certain way. In fact, that is mentioned parenthetically in the article. However, I was referring to the general commonality if having to “dress to impress” to get a job, to get ahead in life, even to find a spouse. While I understand, and don’t deny, hijabis also face such issues, I was trying to get the point across that Allah has commanded modesty for us all to assist in removing the superficial barrier of physical appearance (for one reason, anyway). When family members force or coerce women to wear hijab for cultural reasons (or whatever reason they have), would you consider this to be objectification? I’m not sure I would classify it that way, but it might for others. A non hijab wearer I totally understand this article and also the position of you wonderful women who do wear it. In most of my debates with western colleagues or friends, I get frustrated. They fail to grasp the real aspects and continue their stereotypes that make them think that a woman inside headscarf or a burka for that matter is NOT normal like them or me. “A non hijab wearer”…is that a moniker now ? Salam brother, where did you emerge from? I don;t know what’s a moniker, I dont do the hijab so am a non wearer. Hmm I like to think from my mother’s womb…oh wait she was a housewife who wanted to have children…oh does that make her “un -self-actualized” because she does no work ? So you identity yourself as a non-hijabi…what a silly thing, almost as silly as being a “hijabi”. P.S. Sister Corbin, why in God’s name do you have a leaflet poster on the right saying Muhammad ibn ʿAbd al-Wahhab as a Great man ???? He was traitor, fanatic and petulant prevaricator. Eastern Writer, a “moniker” is a name you use for something. Like, coining a phrase. Hyde, the moniker for your mother would be “housewife” or “stay-at-home-mom”. You defend General Zia, but defame Wahaab? He had his bad and good. He should not be painted with a broad paint so easily (I think I remember someone saying to me once). Even though I don’t consider myself Salafi. or wahabi I will say that his kitab alTawheed was an immense contribution to the ummah. His methods outside of his authorship were questionable. As for your mother, she was actualize in her noble profession of raising children in the deen and laboring in her home to keep her family healthy and happy. May Allah reward her. The point is not to make women feel bad about their choice of career, the point is that they HAVE a choice. Zia was a politician, Wahab was a traitor and a fanatic that gave dais to the heretical saudi dynasty. The writings of Marcus Aurelius could also be seen as beneficial to the “umma” as well. What Stephanie said. Can you not put yourself in the position of a women who has no choice? Can you not see how oppressive this can be? You focus on being so contrary and dismiss any validity in what I say. What is the point? I agree….having a plethora of choices is not always the best thing. However, having the right to make a CHOICE should be fundamental. If we’re deprived of the ability to choose, which Allah gave us, then we cannot learn or come to know our true or full potential. For example, there are a multitude of careers out there. Sometimes, many times, students are overwhelmed at the choices. They just choose the easiest path, or the weirdest path, or the newest one. This may lead to poor results, yes. But it could lead to amazing opportunities. However, let’s say you have a passion for writing, but your parents force you to study engineering because your father is an engineer, and his father was an engineer, and so on and so on. What will your father reap? Most likely resentment. Perhaps you’ll grow to “love” and respect engineering, as a arranged couple eventually comes to love each other. But you may be miserable the rest of your life. Point being, the negatives of having too many choices don’t outweigh the positives of having the right to make your own decisions. It is my sincere hope your mother stayed home to rear her children because she wanted to, and that she was not forced to take on the role of SAHM due to cultural standards. Nevertheless, I’m sure she did her best to fulfill her motherly obligations to you and your siblings (if you have any). Like Sister Corbin said, the importance is not necessarily WHAT the choice is, but that there is one. If choice was unimportant, Allah would not allow us to sin. It’s in choosing to do right that we earn His favor. Nope, she is my mother. That is it. Nothing else is needed. Needed for what? To describe her? Surely, there are a multitude of titles she can be given, besides just “mother”. How about “daughter”, “sister”, “wife”, “aunt”, “friend”, “niece”, “granddaughter”, to name a few? Forget “cook”, “maid”, “nurse”, and the various other roles she plays as “just your mother”. If you’re claiming that she does not “need” to be anything else by your standard (i.e., there’s no other need for her in life than to be a mother), that’s very short-sighted. I’m sure, once you left the house, there are/were other things that she tends/tended to…….do you think she’s so one-dimensional that she is to be relegated to the position of the cartoon character who wears the same outfit every day, does the same job, eats the same food? Surely not. Despite being your “mother” first and foremost, she is also a human who has her own interests, hobbies, curiosities, etc. To deny her these certainties is to take for granted the person she is. Sure, she’s your mother. Of course she will identify with that title wholly. But you can never claim she is “just” anything. Thanks for reading, Eastern Writer! One of the things that ticks me off most about these posts is the insinuation that a woman without hijab is “dirty”. That’s ridiculous. A person is only as pious and religious as they want to be. 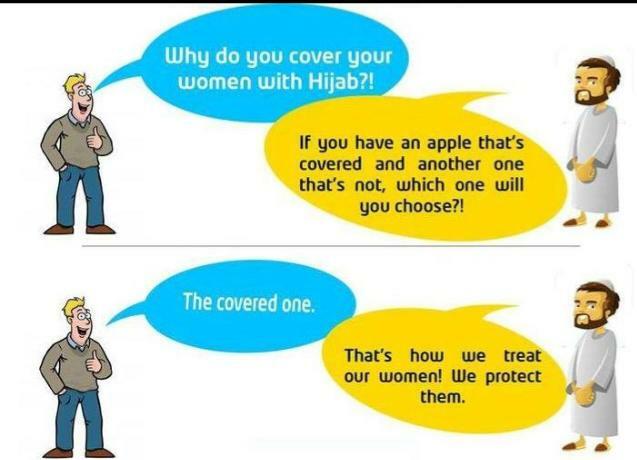 The hijab doesn’t protect or stop a woman from doing wrong anymore than a “cover” stops an apple from rotting. What’s on the inside, invariably, is more important than what’s on the outside. Frankly, we all struggle with our deen in one form or another. For some, it’s the aspect of prayer, for others fasting, and some have issues with hijab or other components. As we know, there are 5 pillars of Islam. Hijab is not one of them. As we know, there are major and minor forms of shirk. Not wearing hijab is not part of either. Wearing hijab is something a woman must decide for herself. Yet, the decision remains between herself and Allah alone. Beyond that, the only thing that should make someone say whether she is “good” or “bad” is her actions toward others. Too often, we spend time judging others for things that are Allah’s alone to judge. The decision to wear hijab is one of them. One example of such is my sister-in-law. She has never worn hijab, and though she believes in its importance and wants so badly to wear it, she is in fear of putting it on and then taking it off. She is nearly 50 years old. However, despite not wearing hijab, she dresses modestly and acts in a manner that is more respectable and admirable than most other women I’ve known…in my life. I love her dearly, and she’s someone I look up to for religious advice and manners. Clearly, hijab does not instill such value in a person. If they do not have appropriate values and morals, it doesn’t matter if they dress in a bikini or a burqa. May Allah bless you and make your life better always! Concur, but this idea of “don’t judge me, God is in my heart” can pave a path to much flagrant opportunities and self righteousness. Yes, I have many times pointed this issue out in my postings too, that those who don’t wear it also face strong resentments and weirdest possible stereotyping. The issue with today’s world is centered on “MUSLIM WOMEN” now as much as this frustrates the hell out of many of us, beyond the usual sentiments I see also an opportunity as you said to be who we are and concentrate on being good humans. Yes, as you rightly pointed out — I listen almost daily to the rantings of my hijab abiding colleagues who get harassed despite being covered. Wearing hijab should be private but we see that both east and the west use the narratives of veiling and Muslim women to suit their agendas. Off-course, judgment is solely Allah’s job. Bless you and your sister in law and yes superficial items like beard and hijab are not measures of values and morals. Keep speaking up and all your good work! Allah Bless you all. Hyde, if you’re referring to outward physical violence, you’re throwing in a red herring. Clearly, clothing choices have nothing to do with a person’s actions. I’m referring to judging people for things that are not ours to judge — Allah has given us laws for judging those who commit atrocities against His other children. Oh, and of course, let a woman run around naked (I mean COMPLETELY naked), and she’s empowering herself, donning femininity! But let her cover herself up, and she’s the epitome of patriarchal discrimination. @SisSamIAm_I Facetious? Can one make facetious jokes about women too? Or does that border misogyny? Because ‘it’s not funny, because so many women suffer’, right? @SisCorbin I have been on your blog for long enough right? And I have agreed where I concurred and disagreed where I have disputed. I never understood why there is any need for hostility even in polemical arguments. Not every post should have ‘awesome job’ comment. And these one-liners on the poor plight of the exclusivity of women are not going to get us anywhere. It hasn’t since the ‘60’s, as Erin Pizzey points out. I see bus ads about ‘how little girls can be anything they want to be’ etc. etc. It makes all good flash but where is the real argument at hand ? Why re not the roots of issues being discussed ? We all seem to be looking at appendages instead of the entire body. @SisSamIAm_II I agree, but how many so-called choices are already made for us, even though we may not be aware? Motherhood takes the blame but what about the illusion that women can become CEO’s, if one out of a million makes it? @SisSamIAm_III I did not leave the house, nor do I have any attention of doing so. I was referring to the nobility in motherhood and of course, I am not, denying that a woman can be many other things, but the nobility of motherhood is down played it is atrocious. There is no hostility. I hold no ill will. And as you stated in the past you have disagreed with me and I have not had a problem with that. I argue my point and go one my way. I am not looking for only complements on posts, nor do I expect it. If I were looking for a completely sycophantic audience I would not be writing about Islam. All I am trying to convey is that there is a need for a movement for Muslim women to regain their God given rights. And you consistently assume too much and fill in too many blanks. I say what I mean, and mean what I say.